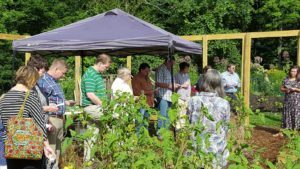 Boone UMC opened a new community garden in Summer 2017. Church and community members are invited to come plant, work, and harvest produce. The garden is a “sharing garden”, where produce is shared with neighbors, local food pantries, and community meals. Want more info? Contact Pastor Laura. Providing prayer shawls and lap robes to those who are ill, Linus blankets and baby hats for newborns at Watauga Medical Center, and caps for cancer patients. Baby blankets are also created for newborns in our church family. Church members donate, cut, split, and deliver firewood free of charge to over twenty families and individuals in Watauga County. Wood is available for pick-up or delivery on volunteer work days: Saturday mornings and Tuesday afternoons in the Fall and Winter. If you are interested in serving in the ministry, please fill out this form and return it to the church. For more information contact Susan Diefes by email or at 828-262-0683. This ministry maintains a three mile hiking trail for the community behind the church. Come join this group every Tuesday during the Fall and Spring from 4:30 pm until dark as they complete the last half mile of this trail and maintain the existing trail. For more information, contact Eric Heistand. Church members of all ages tend to the produce garden at the church to provide fresh organic vegetables to area food pantries and people in need. In addition, church members glean from the Saturday Watauga County Farmers Market and bring the produce to area food pantries. Church members with experience in the construction field offer their time and skills to people in need in Watauga County through home repairs. Church members visit various elderly community members that are shut-ins, often sharing meals. Members from our church volunteer to work with Watauga Habitat for Humanity through work days on the third Saturday of most months. If you would be interested in serving with Habitat for Humanity, please contact Laura Byrch or click here to sign up for a scheduled work day. Virginia Young leads an annual trip to Red Bird, Kentucky for older adults seeking to serve at Red Byrd Mission. The trip, typically in October, offers a chance to work with the Red Bird Senior Center, Community Store, and other local projects. where God might be calling you to serve.